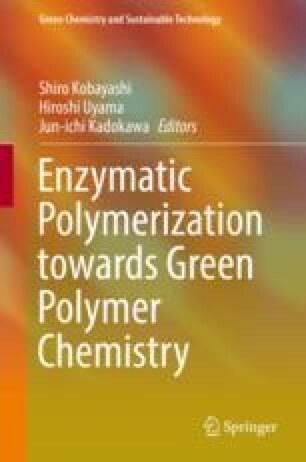 This chapter reviews enzymatic oxidative polymerization to aromatic polymers. Phenols, anilines, and thiophenes are subjected to the enzymatic oxidative polymerization. Peroxidases with the use of hydrogen peroxide as oxidant efficiently induce the oxidative coupling of phenols to phenolic polymers, most of which are hardly obtained by conventional chemical catalysts. The enzymatic oxidative polymerizations have merits of using nontoxic catalysts and mild reaction conditions, and the specific enzyme catalysis provides regio- and chemoselective polymerizations to produce functional materials. Laccase and peroxidase are useful for production of cross-linked polymers such as artificial urushi and biopolymer hydrogel.